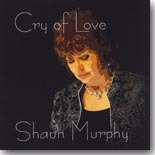 Shaun Murphy's latest CD, Cry of Love, features a collection of her favorite songs. Judging from the tunes that were selected, she obviously has exquisite tastes in blues and soul music. It's our Pick Hit for the month. The stunning debut of Southern blues singer Daunielle Hill, simply titled Daunielle, is the Surprise pick this month. This month's Flashback features an early Blind Pig Records release, Gravel Road, from Magic Slim. Our What's New section features reviews of new CDs from Mighty Mike Schermer, Tommy Castro & the Painkillers, Mark T. Small, Eddie Cotton, James Armstrong, Smokin' Joe Kubek & Bnois King, J.J. Thames, and more.